Snowflake Lake is a board in Mario Party 6. It is a winter wonderland, similar to Chilly Waters in Mario Party 3. 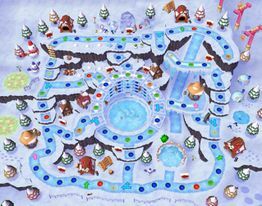 This snowy board is surrounded by colorful evergreen trees, dog houses, and a few snowmen, along with a ski lift at the top-right corner of the board, and ice sculptures of a penguin, Mario, and his 8-bit form. In the center of the board is a small frozen pond that contains what appears to be the skeleton of a Bone Dragon. A Whomp blocks a path in front of an Orb Shop, and charges 10 coins for people to pass. Going this way will take the player to the right side of the frozen pond. There are no Star Spaces on this board, nor does it feature any other method of buying Stars. Instead, each player starts with 5 Stars (or more depending on the number of Star handicaps), and the objective of the board is to steal Stars from the other players by riding Chain Chomps. There are four dog houses on the board, and when a player reaches one, they have the option of paying coins to ride a Chain Chomp. During the daytime, players can ride Chain Chomps at the cost of 20 coins for a Dice Block and move that many spaces from the dog house. For every player that the Chain Chomp passes, a Star is stolen from the victim and is given to the player riding the Chain Chomp. At night, players can purchase up to three Dice Blocks per ride, with each one costing 10 coins. Although this board has no Stars, the only way that additional Stars can be received is from Donkey Kong via the DK Space. This board's premise is later reused for the Mario Party 7 board, Pyramid Park. Landing on one of the two ? Spaces at the top of the board will make a snowman throw a large snowball that will roll along the path. This is again similar to the big Mr. Blizzard from Chilly Waters, although there is no way to avoid this one. As it goes, it captures any players that are in the way and takes them back to the start. Landing on a ? Space next to the frozen pond activates a coin game. The rules are different depending on the time of day. During the daytime, Brighton will toss coins down to the players, who grabbed them while skating, until time was called. At night, players throw snowballs at each other to knock coins out of them for the taking. 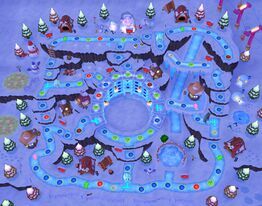 Also during the night, large Freezies appear, blocking the paths to the middle of the board. They will melt when daylight comes. Additionally, during the day, there are two ? Spaces near the frozen pond; at night, there are four. The board has a lot of Duel Spaces. In fact, it is the only board in the game where a Duel Space can be reached on the first turn.
? Space event: players go ice-skating for coins.
? Space event: players participate in a snowball fight to steal coins from each other.
? Space event: A snowman throws a ball into the character's path, taking any character in its way into the start space. Luigi near a Whacka sign, near where Whackas pop up from. Luigi near another area where a Whacka can be found. A Snack Orb being used against a Chain Chomp attack. This page was last edited on April 19, 2019, at 21:27.